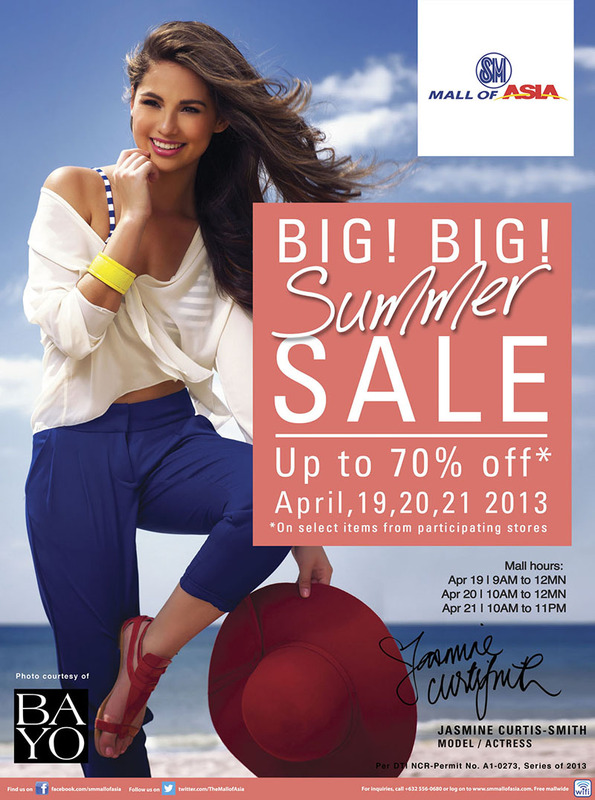 It’s the BIG BIG Summer Sale at SM Mall of Asia (MOA) once again! Just in time for all of you who are gearing up for their summer trips. Sigh… don’t you just love MOA sales? I’ve been attending them for quite some time now and I must say, I never go home empty-handed. I just couldn’t resist all the wonderful bargains–everything from beauty brands to apparel down to electronics! Of course, I’m sure you all know the brands I go gaga over the most–anything and everything related to fashion. I always look forward to shopping at MOA’s fashion brands like Tomato, Bayo, Zara, Mango, Warehouse, Apple & Eve, Lacoste and so much more. I’m wearing items from these brands now! I just wish I bought them at the sale. Oh well, maybe you can! The top I’m wearing here is actually the same as the one Jasmine is wearing on the poster above. I bought this from Bayo in preparation for my trip to the beach. I loved its fabric, cut and the way it falls so much, I actually bought it in navy blue as well. It’s the perfect beach cover up! But just because it’s a great beach cover-up doesn’t mean you can only use it at the beach. A big reason why I love this top so much is because I can still use it for other occasions as well. It’s very versatile. Casual shopping days, lazy Sundays, work days, events–you name it! To jazz my outfit up a bit (not by just a bit, a whole lot actually), instead of my normal black trousers, I went for these shiny sequinned pants I got from Zara. I feel very Michael Jackson-esque in these pants. They make me want to bust out the iconic Michael Jackson pose. LOL! But my better judgement got the best of me and so I decided to stick to my usual poses and spare myself the embarrassment. Haha! Oh, lucky you. There’s a chance you might get these items on sale. Oh well, I’ll just scout for other bargains at the sale to make myself feel better. LOL! See you there, okay? Don’t miss out! The SM Mall Of Asia BIG BIG Summer Sale is happening this April 19-21. Selected items from participating brands will be on sale for up to 70% off! GAH! For more promos and updates, follow @TheMallOfAsia on Twitter and LIKE them on Facebook. I never thought that sequined pants and long-sleeved top would actually look “presko”. Hehe… Nice combination! I’m sorry if this has been asked before, but do you have a closet tour / clothing organization video or photos? :) You have so many brands, I was just wondering how you organize them! I especially love your layering of your jewelry. :) Keep up the good work and always be preeeeeeeeeetttty! Hurray for Filipina pride. Not yet but I’ll do that next time! :) Thanks gift princess! Wow those pants look absolutely amazing on you! I don’t know if I can pull them off though as I tend to look really weird in sparky/shiny clothes. lol. J'aime ton collier ! Bisous. 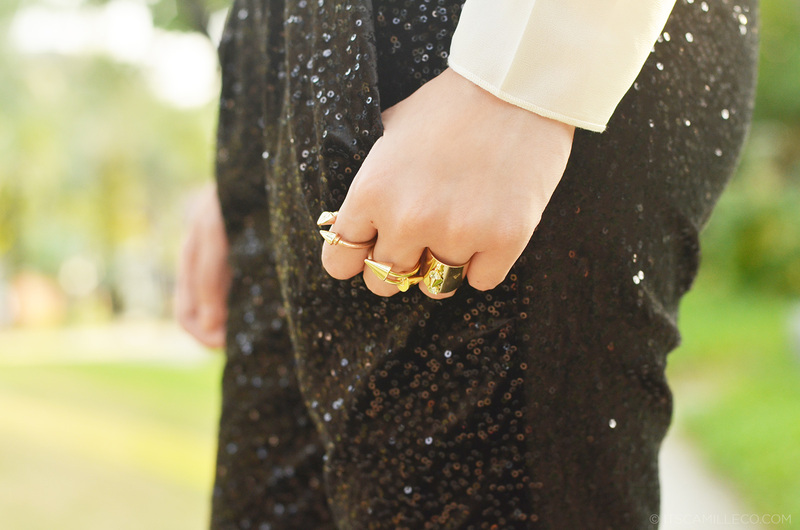 I love the black gold and white combi! Its so classy! I love how this outfit look so good together, Ms Camille! Everything matches so perfectly!! and that is indeed one fancy pants! oh my god…you look hot!!!!!!!! I love your shape and your style! These pants and blouse matchs perfectly! Too bad I’m tiny and I’d look very weird wearing this pants. But in you it fits very well! OMG Bali! I really want to go there some day! :) Thank you in advance Vitawulans! MJ pose? as in the crotch grab? chos. haha! BTW this is the 1st time na naging obvious yung veins mo sa paa! Do you apply lotion on your feet? Anong brand ginagamit mo? Great look Camille! I’d love to check out this sale haha! Nice! ^_^ mezmerizing from Ms.Camille Co again. ahmm..if you dont mind Ms.Camille.. did you cut your hair again?. :) I just love looking at your hair too..